Do not ask me to chose a favorite Thanksgiving food. I will glare at you while I shove buttered roll after buttered roll into my grimacing face. I love Thanksgiving. It is my favorite holiday and I am never more excited for food than I am on that chilly November Thursday. While I could never pick a favorite food (okay, it might be green bean casserole), my favorite Thanksgiving moments are often those before the meal, when the house is filled with a profusion of the warmest and most comforting fragrances, the voices of loved ones, the thrill of flipping through ad after ad as my sister and I formulate our Black Friday plan of attack, and, perhaps best of all, the pre-dinner snacks. I am kind of an appetizer nut. The table full of olives, salami, gooey artichoke dip, and toasted baguettes sets my heart a flutter. I sneakily grab half of the ever-present port wine cheese and eat it without reservation. It is cheap and cliche but I love it so. This year, I wanted to create a punch for the appetizer hours that would be as pretty as it is delicious. Many of my favorite holiday flavors are present here. Cranberries, oranges, and limes float in a combination of spicy ginger beer and holiday-spiced cranberry syrup. It might remind you of sangria, but one that the whole family can enjoy. Whole cranberries, sugar, allspice berries, star anise, cinnamon sticks, and a bit of water simmer until a thick, pink syrup forms. While the syrup cools, the fun part begins. 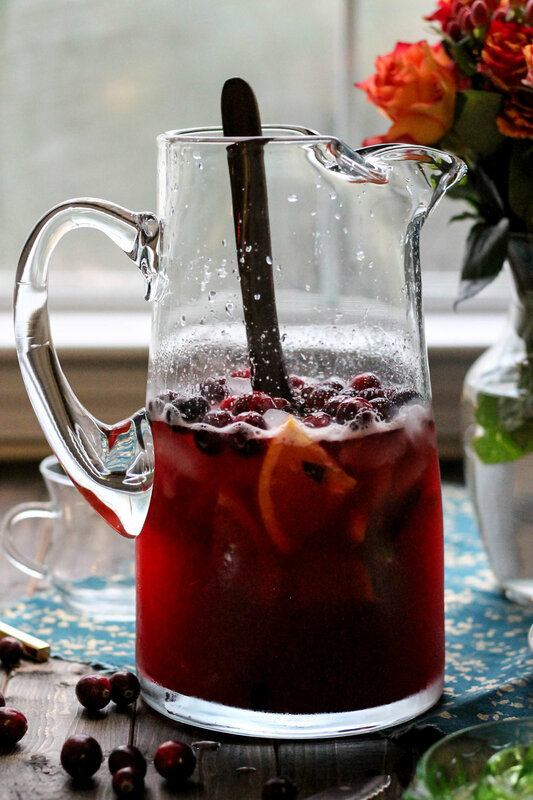 Orange slices, lime wedges, cranberries and whole spices make this pitcher look like it’s straight off of Martha Stewart’s table. I always think of Martha Stewart around Thanksgiving because one year, my whole family ended up with a gut-wrenching flu bug just days before the holiday and I lay in bed with my mom and sister watching the only two episodes of Martha that we had on DVD, both of which were Thanksgiving specials. Who would have guessed that influenza could bring about such special memories? This punch greatly improves after an hour in the refrigerator, which is convenient because that means it can be made early Thanksgiving morning and will be ready to serve when your guests arrive. We have but a few solitary hours before the madness will commence. Take this time to make yourself a pitcher of this punch (and be sure to "sample" it thoroughly), brace yourself for the grocery shopping, and finalize your menu. If you are in need of inspiration, consider this list from last year. I still have not decided on a pie, so I should probably get on that. P.S. I really hope you are brining your turkey. Please brine your turkey. DO IT. Combine cranberries, water, sugar, and spices in a medium saucepan and place over medium-hight heat. Bring the mixture to a boil and cook for 10 minutes; remove from heat. At this point, the berries should have bursts and softened significantly. Pour the mixture through a fine mesh strainer or a colander lined with cheese cloth to remove the spices and cranberry skins. Allow the syrup to cool until it is just warm. While you are waiting, prepare the other elements of the punch. Pour the ice into the bottom of a large pitcher. Cover with fresh fruit and whole spices. Pour the fruit juices over the ice and then top with the cooled cranberry syrup. Stir to combine. Serve the punch over ice. Enjoy! 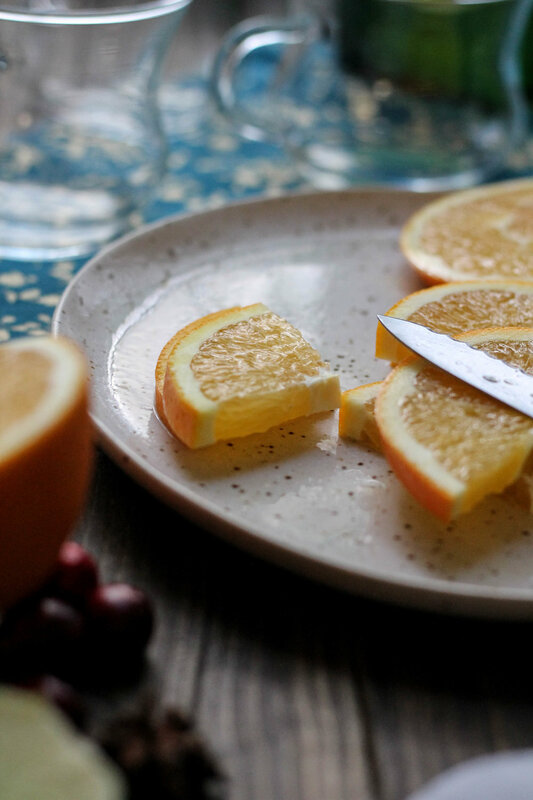 *While one hour will deepen and meld the flavors of this punch, extended refrigeration will lead to an overly strong and bitter drink, due to the presence of the cut citrus and whole spices. I would not suggest making this more than three hours before you plan on serving it. The boxes are beginning to pile up, the paint has been purchased, and a sense of transition mingles with the comfort of my pumpkin-scented candles.